Have you ever heard of the term, “Forty Acres and a Mule”? (See footnote #1 below) It was a false promise of compensation to the victims/survivors of slavery and victims/survivors of the many battles and wars with the American Indians. The term comes from the way land was divided and sold in Alabama, Georgia, Florida and South Carolina. In 1875, the United States congress established the United States Public Land Survey. The purpose of this US Government Office was to dispose of land. This was land that was acquired from the many wars with the American Indians, in Alabama. The acquisition of American Indian land began with the Creek Indian Nation war of 1813-1814. In this war, the Creek Indians were supported by Spain and England and fought against General Andrew Jackson. The war ended when the Creeks were forced to sign a treaty giving up forty thousand square miles of land. Around 1819, Joseph and John Kennedy were the first members of the Kennedy family to migrate and settle in Southern Dale County, Alabama (from Ireland to South Carolina to Georgia to Alabama). Remember Joseph Kennedy, he was married to Sylvia Kennedy; they had a son John L who was father to Peter Kennedy which is Papa Doug’s father. On land records the name was spelled Kanady, Canady, and Canaday. This is because they were Irish and spoke with a heavy Irish accent. In the late 1820s the Snell family began migrating to Dale County (from North Carolina to South Carolina to Georgia to Alabama). 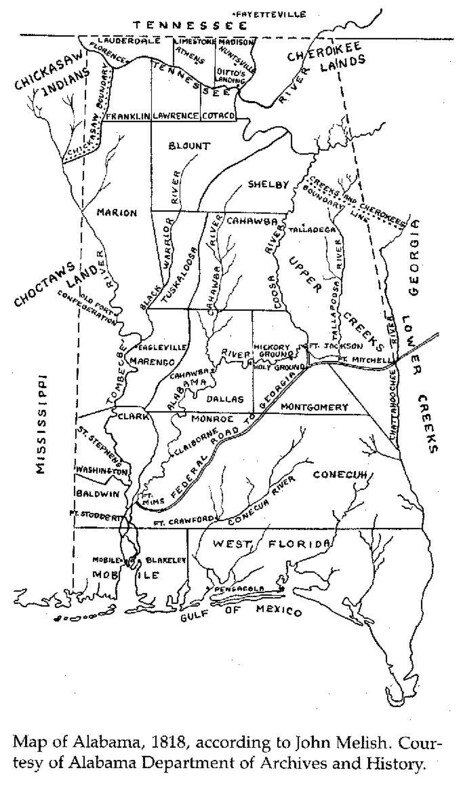 In Alabama, the US Public Land Survey conducted two surveys, the Meridian Survey and the St. Stephens survey (there was also a Freeman Line which was a line running east to west in mid-Alabama that divided the state). The Meridian Survey was in the Northern part of the State and the St. Stephens Survey was in the southern part of the State. 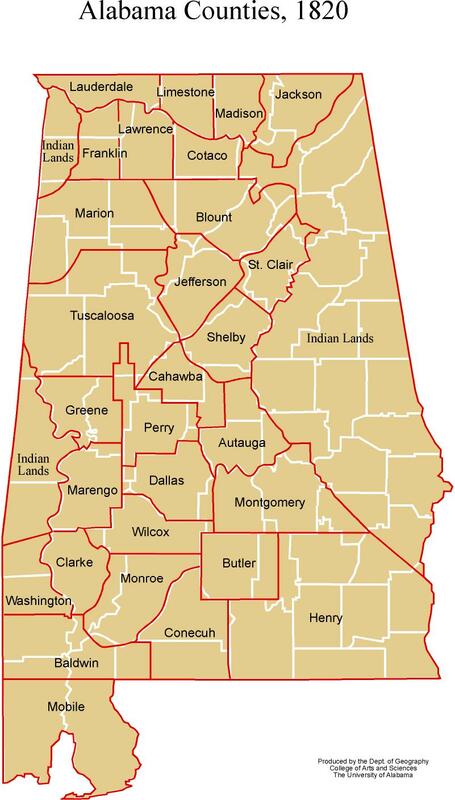 Midland City, Pinckard, Newton and Shady Grove are in Dale County which fell under the St. Stephens Survey. 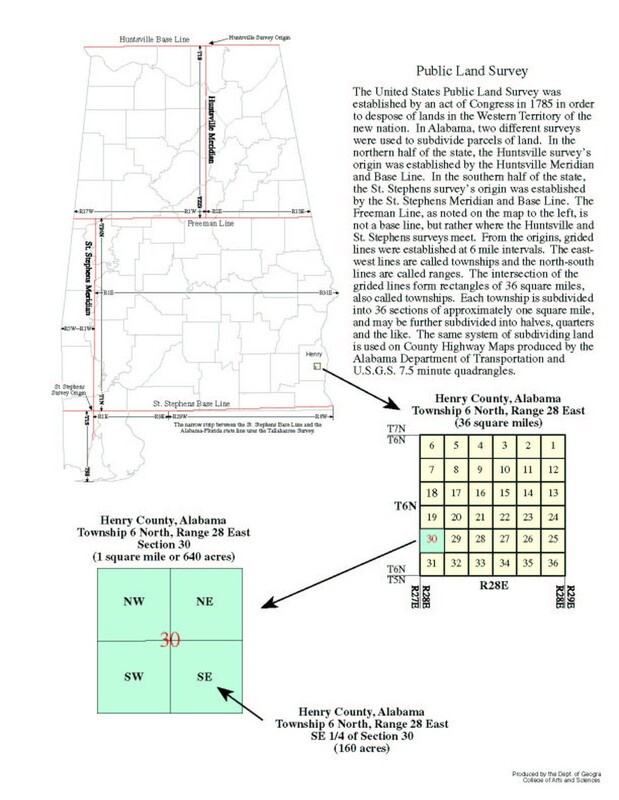 The surveys divided the land in Alabama into six mile blocks. These six mile blocks were called Townships (see footnote #2 below). Townships were further divided into one mile blocks. So, each Township consisted of a 36 one-mile block square. The one-mile block square was further subdivided into 16 blocks, where each one of the 16 blocks consisted of 40 acres. 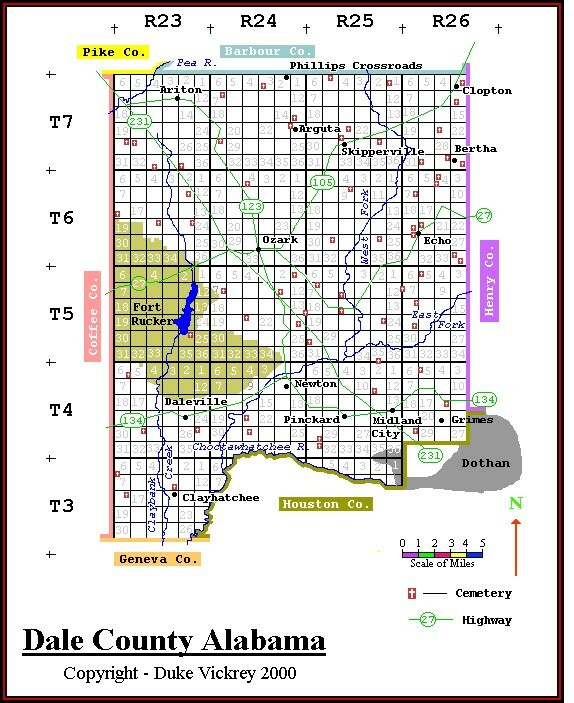 This was the smallest acreage Alabama sold the land acquired from the American Indians and the land sold for a whooping $1.25 per acre in the early 1800s (US Government called this disposing of land). Midland City is in between the 13th and 24th blocks of Township # Four. It sounds complicated but it is not, check the Township map in the website. Pinckard is in the 21st block of Township Four. In the early 1800s, the Kennedy family and the Snell family owned at least 50% of the land in and around Daleville, Newton, Midland and Pinckard, all of which was in Township Four and comprised about a ten mile by six mile block of land. A lot of the land was in rural areas (unpopulated) and was a burden to maintain. One of those burdens was the American Indian who made numerous attempts to reacquire the land. So both families began neglect the land and eventually forfeited their rights and the government confiscated the land and resold it later when the areas became more populated. Geronimo of the Apache Nation and his warriors (some of which were Cherokee) were promised forty acres of land and two mules for his surrender (surrendering meant living on a reservation/prison for two years) by US Brigadier General Nelson A. Miles. Former Slaves were promised 40 acres and a mule by the US Government, mainly the Military, in return for cooperation, collaboration, support and acceptance of the American way of life. Other American Indians were promised two mules along with the 40 acre land promise. Of course the promises were never kept and the promises were really never sincere. I cannot help but to think that at some time somewhere somebody actually delivered to someone 40 acres of land and a mule or two to work the land as a peace treaty. It had to have happen. The guilt that America held from decades and centuries of free slave labor and the deceitful massacre of the American Indians spawned a false promise of hope of reparation, reimbursement, and compensation. I can only relate free land from the government to welfare (gov’t cheese, powdered milk, and spam); it leaves a bad taste in your mouth. No one really owns the land in Alabama or any other part of the US of A. We can only hope to live off the land for a temporary period of time. But before you can live off land in this country you must first establish a residence, pay taxes or have good connections in the land office. This makes me wonder. Should this rule apply to Former Slaves and direct decendants of slaves who were never properly compensated for service to this country? Should this rule apply to the American Indian? Well it does not totally apply to the American Indian because America establihed reservations for the American Indian. These reservations resulted in welfare states, but today reservations are developing into casinos (a little payback to “da man”) which can be lucritive if done right. There is still inexpensive land in Alabama and you can still buy land at a very decent price in Southern Alabama. I always wanted to move to Alabama and buy land in the area where our heritage lay; it sounds nostalgic moving back to the land of my ancestors. But once I actually went to Alabama and saw the area and realized the amount of work required to clear the land, build a house and fight the four legged critters showing up at the front and backyard, I was a little discouraged. But then again, I always looked forward to a good challenge. Another discouragement was the lack of resources that I have become accustomed to in the DC area like malls, museums, theaters, entertainment, restaurants and snow storms. The beauty of the landscape and the sense of peacefulness are appealing. I’ve been spoiled by the city life and it has led me to believe that although the land seems inexpensive to acquire, it ain’t cheap to live on. As a final note, our family of today and yester-year is made up of people from a variety of cultures and backgrounds. We have bonded together through blood and common beliefs to be a family. We have sought and found the good that exists within ourselves and choose to share that good with others regardless of culture or background. Good transcends race and culture and background. Our family, united as we are and we are untied; survive on the good within ourselves and the good we see in others. God bless and see you in July. Footnote #1: 40 acres and a mule is the colloquial term for compensation that was to be awarded to freed American slaves after the Civil War — 40 acres of land to farm, and a mule with which to drag a plow so the land could be cultivated. Footnote #2: “The award — a land grant of a quarter of a quarter section deeded to heads of households presumably formerly owned by land-holding whites — was the product of Special Field Orders, No. 15, issued January 16, 1865 by Maj. Gen. William T. Sherman, which applied to black families who lived near the coasts of South Carolina, Georgia and Florida. Sherman's orders specifically allocated "the islands from Charleston, south, the abandoned rice fields along the rivers for thirty miles back from the sea, and the country bordering the St. Johns River, Florida." There was no mention of mules in Sherman's order, although the Army may have distributed them anyway. After the assassination of President Abraham Lincoln, his successor, Andrew Johnson, revoked Sherman's Orders. It is sometimes mistakenly claimed that Johnson also vetoed the enactment of the policy as a federal statute (introduced as U.S. Senate Bill 60). In fact, the Freedmen's Bureau Bill which he vetoed made no mention of grants of land or mules.